The Clutha Mata-Au River is New Zealand's largest river. It carves 338 km from the Southern Alps to the Pacific Ocean, traversing the semi-desert heartland of Central Otago. The extraordinary qualities of the Clutha Mata-Au place it among the great rivers of the world. It ranks in the world's top ten swiftest rivers, and its clear turquoise-tinted waters - the result of glacial and snow-melt filtering by upland lakes, are a global rarety. 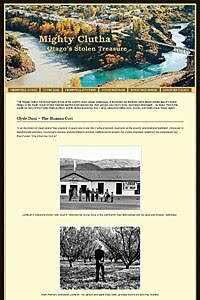 The Clutha Mata-Au is also known for its spectacular riverscapes, its unique ecological, recreational and tourism values, and its Maori, pioneer and gold-rush history. By many criteria it is a national treasure. 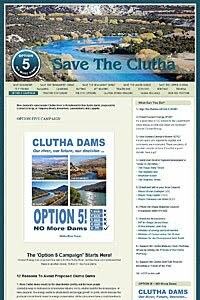 Unfortunately, the Clutha Mata-Au is being degraded by subdivision developments, reduced recreational access, loss of dry-land farms and open spaces, loss of endangered indigenous plants, declining water quality and ecosystem integrity, land-use intensification and increasing abstraction. Prior to May 2012, it was also threatened by further "Think Big" dams. The many serious issues facing the Clutha Mata-Au River corridor need to be addressed collectively and consistently from Lake Wanaka to the Pacific Ocean. The mission of the Clutha Mata-Au River Parkway project is to protect and improve the Clutha Mata-Au by establishing New Zealand's largest river park, including a river-length Mighty Clutha River Trail. The river park and trail will bring significant long-term economic benefits to the river communities and the region. 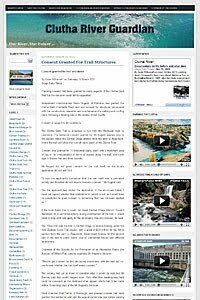 The Parkway Group is an umbrella organisation assisting local trail-focused community groups such as the Clutha Gold Trail Trust, the Roxburgh Gorge Trail Trust, and the Upper Clutha Tracks Trust. Our membership consists of river corridor stakeholders. The Clutha Mata-Au River towns and communities include Wanaka, Luggate, Cromwell, Clyde, Alexandra, Roxburgh, Miller's Flat, Beaumont, Tuapeka, Clydevale, Balclutha and Kaitangata. We are working to create New Zealand's largest river park, and we welcome your support and involvement. "Nothing, perhaps not even climate change, will matter more to humanity's future on this planet over the next century than the fate of our rivers." ~ Fred Pearce, When the Rivers Run Dry.